The next few months will be bittersweet at Ray of Hope as CEO Harry Whyte prepares to retire. In this issue, he talks about the amazing growth that supporters like you have made possible and the future challenges facing all of us who care for the homeless, hungry and hurting. Under CEO Harry Whyte’s watch, Ray of Hope has grown to serve even more neighbours in need. Now as Harry prepares to retire, he has a special message for you. 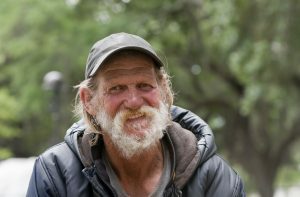 During a period of uncertainty in his life, Harry Whyte promised that he’d say yes to whatever door God opened for him. Those doors led to a seat on Ray of Hope’s Board of Directors and eventually to the CEO’s desk. This year, after leading Ray of Hope for the past decade, Harry’s retiring. Now he’s reflecting on how the organization, too, has approached the opportunities—and the challenges­—God has provided. Ten years ago, many people didn’t know all of what Ray of Hope was. They might recognize individual programs but not the organization as a whole. Fast forward a decade and so much has changed. The Ray of Hope Community Centre (ROHCC) has grown from a small drop-in program to a 15,000 square foot facility that’s open seven days a week and feeds up to 300 people every day. Guests now enjoy a range of programs that offer companionship, recreation, and spiritual care. And as Ray of Hope has become a trusted community resource, we’ve been able to partner with other local agencies to provide our guests with access to health care, subsidized housing and more. Ray of Hope services have also expanded to help even more young people heal from addictions, serve time productively, or find employment. And two years ago, after a lot of prayer and consideration, Ray of Hope adopted the Welcome Home program to help care for refugees. All of this, Harry notes, would not have been possible without the support of people like you. Many of our programs run entirely on donations. Other services, like Youth Addictions and Youth Justice, receive some government funding. But despite the growing need for these programs, funding dollars haven’t increased since 2009. And smaller agencies, like Ray of Hope, don’t have the clout of large charities to press the governments for additional funding. “I worry that the framework of foundational services provided by smaller agencies will one day collapse,” Harry says. That’s why your support over the past ten years has been so important. Your help ensures that the most vulnerable people in our community continue to receive care. “When I visit churches, I tell them, ‘Don’t support Ray of Hope’s ministry,” Harry says. Left: Pastor Bob Baumann (third from left) and friends Dave, Elmer and Don are some of the members of Eastwood Christian Fellowship who prepare a roast beef dinner for 300+ ROHCC guests every month! Maybe you’re a member of one of those churches. 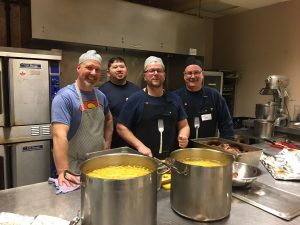 Or perhaps you belong to one of the dozens of groups, from Grand River Transit drivers to Stantec employees to a motorcycle club, who prepare and serve meals at the Community Centre. You might be one of the people who contribute their time to keep our programs running. Or maybe you walk in the Coldest Night of the Year event, or bike in the Ride for Refuge, to ensure we can continue to care for homeless, hungry and hurting people in KW. However you help, Harry wants you to know how important you are. With every purchase from Morning Glory, you help young people overcome barriers to employment and learn the skills they need to be successful in the workplace. Check out Morning Glory’s catering menu for your summer events. If you’ve visited Heffner Toyota or the FACS Family Centre, you may have grabbed a cup of coffee at the Morning Glory Café. In 2000, Ray of Hope launched Morning Glory as a way to help youth overcome barriers to employment. Through meaningful work experiences and certification in food preparation and serving, participants enhance their life and job skills. What you may not know is that Morning Glory also provides catering for meetings and events. Dishes range from sweet potato and pear soup to chicken and roasted vegetable rotini to a variety of baked goods. Best of all, proceeds help fund the youth employment program. 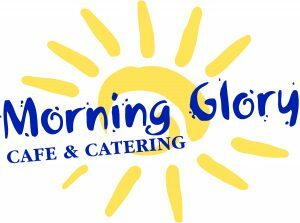 If you have an event coming up this summer, why not consider having Morning Glory provide catering? You’ll not only give your guests a delicious meal, you’ll be investing in our community as well. Check out Morning Glory’s catering menu. You can help young people find employment while enjoying a delicious lunch! Starting in September, Morning Glory will be offering Gourmet To-Go Boxed Lunches. These lunches can be personalized to each person in your group and make catering your lunch meetings easy—and delicious! Plus, they’re environmentally friendly, since all packaging is recyclable. You can get a sneak peek this coming month with The Meat Trio To-Go Lunch (three kinds of meat on a pretzel bun, Greek salad, an apple, two chocolate chip cookies and a Perrier) at a special price of $11.95 per person. Proceeds help to fund our Youth Employment program. Contact Morning Glory for more info or to order. As summer begins, food bank donations drop and it gets harder to stock the shelves at The Marketplace. When you give any of these items, you help to make life a little easier for struggling neighbours.